Tricia has been practicing yoga since the mid-nineties, began her practice of Iyengar Yoga in 2002 and became a certified Iyengar Yoga teacher (CIYT) in 2010 in the UK. After establishing her home in the USA, she has continued the vigorous process of of training and assessment, achieving Intermediate Junior in 2014, and has recently passed the her next level of certification in August 2016. She has also been fortunate to have attained certification by International Association of Yoga Therapists, IAYT a well respected & world reknown organization in the field of yoga therapeutics. Tricia is the director and owner of the new, fully equipped Iyengar Yoga Studio - "Iyengar Yoga St. Petersburg" in Florida. Tricia has studied at the Institute in Pune, under Geetaji and Prashantji Iyengar and also in Bangalore where renown Iyengar yoga teacher and dutiful student of the Iyengars, Arun Bhat has his yoga school. She recently participated as an instructor and co-author of a pilot study of Iyengar yoga for Aromatase Inhibitor-associated Joint Pain in Women recovering from breast cancer, conducted at the Moffitt Cancer Center in Tampa, FL. "I believe myself to very fortunate to be able to share my love and abiding fascination with Iyengar Yoga with so many students that are willing to share their yoga journey with me as their teacher, and we are exploring this beautiful art & science that Guruji has gifted us, together." Until July 2017, Peentz served as Director of the Iyengar Yoga Program at Down Under Yoga studio in Boston, MA and directed the Heart of Iyengar Yoga Teacher Training Program at DUY and the Yoga Philosophy Discussion Group. Peentz continues to serve as an assessor for the Iyengar Yoga National Association of the United States (IYNAUS) Teacher Certification Program and studies regularly at the Iyengar Yoga Institute in India. Peentz’s greatest joy is teaching and helping students to awaken to their full, brilliant potential through this amazing gift of yoga. She is renowned for her sequencing and her ability to personally connect with each student, adapt to their needs, and assist them in reaching their personal goals and full potential. And of course, her deep love of poetry and imagery infuses each class! Peentz became a Certified Iyengar Teacher in 1984 and was Co-Director of the first Iyengar Yoga Center in New York City and later a founding faculty member of the current Iyengar Yoga Institute of New York. Upon moving from New York to Boston in 1994, Peentz began an extraordinary journey studying with Patricia Walden, as well as assisting her in workshops and teaching in the BKS Iyengar Teacher Training Program from 1994-2011. Peentz is delighted to be a new resident of St. Petersburg, FL and is looking forward to engaging with the Iyengar community here. Courtney is honored and excited to be a part of the High Vibration Yoga Studio, home of Iyengar Yoga St. Pete! She first began studying the Iyengar method in 2016 after returning home from a year-long adventure in South America, spent hiking and volunteering on farms and in healing centers. She received a 300-hour Power Yoga certification in 2011 and began teaching flow and fitness-style classes at gyms, studios, and office buildings. After years of teaching large classes in this style, she began to wonder how she could better serve her students. Studying with Tricia, Peentz, and Suzie Muchnick in Naples and has been to a number of workshops including Manuoso, Arun, John Schumacher, and other amazing Iyengar teachers has renewed her sense of purpose as a teacher, with restored faith in the unlimited potential of our being, and confidence in knowing that yoga is truly available for everyone. When Courtney is not at the yoga studio, she is either at Craft Kafe baking gluten-free goodies, at home in the kitchen making nourishing soups, outside walking & photographing birds/flowers/sunsets, at Saturday Market selling her eco-friendly clothing line ShockT Designs, or doing homework for a plant spirit medicine apprenticeship called Medicine Mandala. Courtney dreams of one day leading groups locally and abroad in healing gatherings or excursions, filled with yoga, nature, ecstatic movement and song, plants, art, exploration, vulnerability, friendship, and devotion to serving our highest Self. Irina Samkova is a dedicated yoga practitioner who pursues yoga as a path towards awakening. Her reverence, determination and devotion as a student naturally lead to the vocation of teaching. 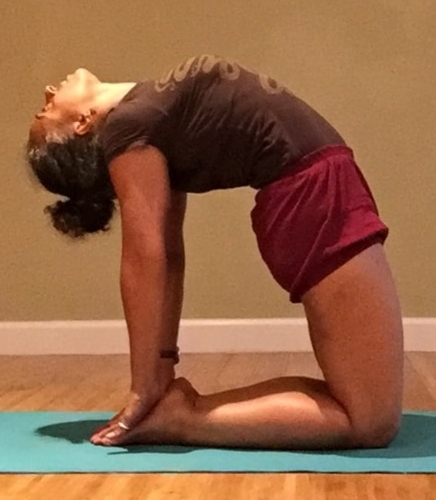 Her teaching method has been influenced by comprehensive study with her mentors Nikki Costello and Lara Warren, both Certified Iyengar Yoga Teachers in good standing. Her personal practice is comprised of the study and contemplation of philosophical texts and scriptures, as well as a daily practice of asana, pranayama, and meditation. Irina's classes are accessible to all and designed to empower students to break through their perceived obstacles, be they mental or physical. She provides a precisely sequenced and challenging class format, while also remaining attuned to the subtler aspects of the practice. In her classes, practitioners can be confident in safely exploring new territory, while gradually actualizing the harmony of body, consciousness, and self. After being in NY for a decade, St. Petersburg became Irina's new home in 2018. Here, she was warmly welcomed into a beautiful yoga sanctuary by Tricia Amheiser and Peentz Dubble, where she is grateful for the opportunity to continue learning, teaching, and expanding her Yoga family. Irina's encounter with the Iyengar method and her ongoing study with the masters of that tradition has inspired her to begin the pursuit of Iyengar Certification so that she may also carry on the lineage. It is her mission to follow this path that has unfolded before her so that she can be of service in her highest capacity for all those who seek to practice and learn.